The moisture-adaptive multifunction tape for connection joints in window installation. The "all-in-one" multifunctional tape is the product of choice especially for the fast and reliable sealing of window joints. The polyurethane soft foam recovers in the joint and thereby seals the window joint permanently. Relative movements of building elements are compensated even after many years. The patented HANNO membrane technology in these innovative products is responsible for the high barrier action of these tapes. 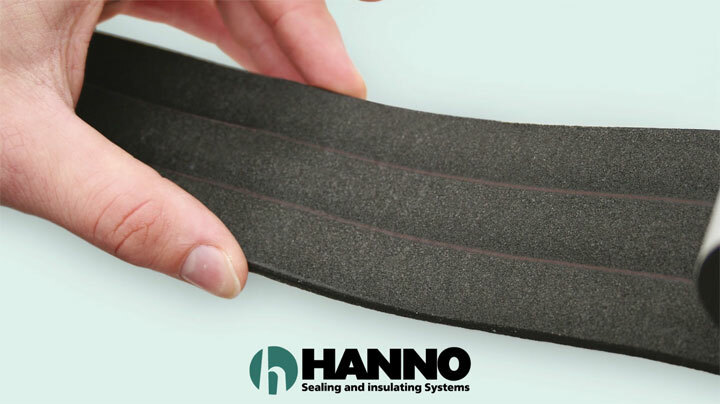 Besides, Hannoband® Multifunctional Tape 3E is excellent for heat insulation and complies with all requirements of the new energy saving legislation. The very good sound insulation properties of the tape complement the high quality level of this product. Due to the integrated functional membranes, the tape acts as a barrier on the side exposed to diffusion. MPA BAU HANNOVER established that the new Hanno® heavy-duty membranes are moisture-adaptive. Moisture is carried out of the joint. This ensures a dry joint all the year round. Click on fitting instructions for Hannoband 3E multifunctional sealing tape. Click on technical specification for Hannoband 3E multifunctional sealing tape. Click on ift Sound Insulation Center's independent assessment Hannoband 3E - Assessed degree of joint sound insulation.